It is not my habit to comment on my paintings. They should "speak" for themselves. I will however give here some clues: "Big Ben" represents our "newtonian" (classical) time but if you look closely its time is... wrong! It is affected by the nearby galaxy's black hole (Einstein's "General relativity"). The "Event horizon" here is replacing our classical traditional "horizon." The galaxy's black hole cannot be visible but if you look at the real painting, the canvas is locally dented as would our space-time when considered as a four-dimensional "brane". "All of my life, I have been fascinated by the big questions that face us, and have tried to find scientific answers to them. If, like me, you have looked at the stars, and tried to make sense of what you see, you too have started to wonder what makes the universe exist. " 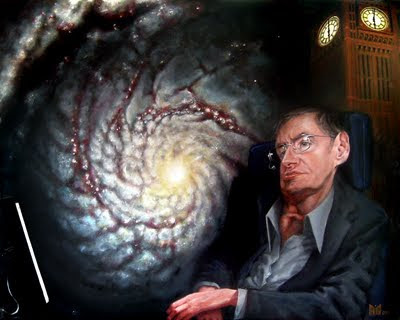 From website for PBS program, Stephen Hawking's Universe (1997). The Clarke-Leibniz correspondance: an England v. Germany football match in the field of philosophy, science and religon! I decided to use Big Ben to symbolize the "Newtonian time" with a catch: the time is wrong, being affected by the nearby "Black Hole" (a consequence of Einstein's General Relativity and well demonstrated by Prof. Hawking), I had also in mind Leibniz's reference to a "clock" in his controversy with Newton). This was the so-called "Leibniz-Clarke correspondence": a scientific, theological and philosophical debate conducted by epistolary means in 1715-16 between German thinker Gottfried Leibniz and Samuel Clarke, an English supporter of Isaac Newton. I SWEAR I wasn't aware of any of this when I started doing his portrait!